Main features are: • First Drive: Jaguar I-Pace. • Interview: Henrik Fisker. • First UK Drive: Nissan Leaf. • Feature: Plant-Based Revolution. 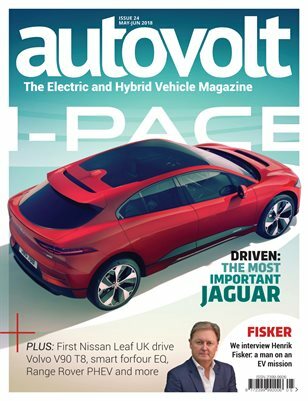 • Reviews: Volvo V90 T8, Toyota Auris Touring Sports & Lexus CT 200h, smart forfour eq, Range Rover P400e PHEV. • Column: Charlie Jardine, EO Charging. • Long Term Test: Toyota C-HR Hybrid. • History: Lohner Porsche Hybrid. • Glovebox: Blink CCTV, Michelin TPMS, Anker torch.